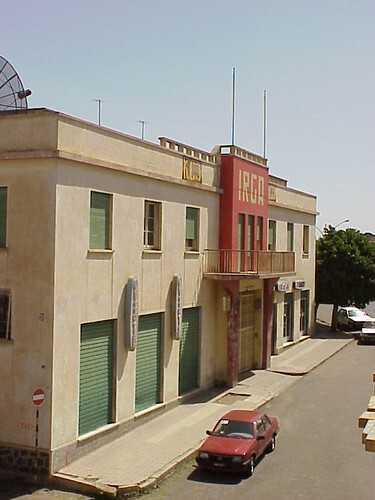 This building is next to the fabulous Fiat Tagliero Building in Asmara. 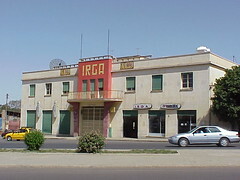 According to Edward Denision in the Bradt Guide to Eritrea the Irga building was constructed in 1961 and designed by Carlo Mazzetti. While walking around on the wing of the Fiat Tagliero building I did manage to grad my gaze to the Irga building and capture this unusual view. 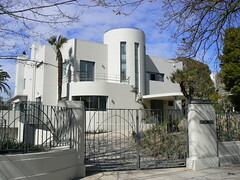 A fab Deco house in Perth. 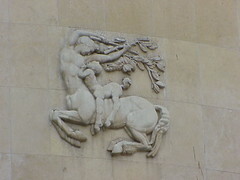 From memory it is on the south side of the Swan with views over to the city centre. 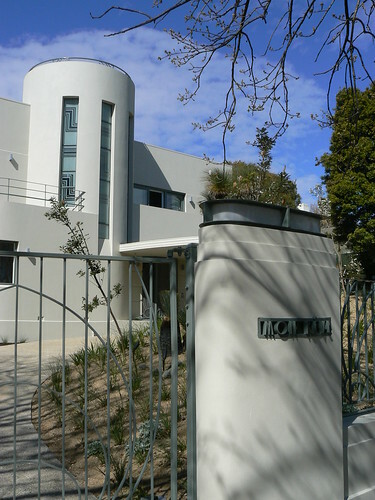 I can't say enough about this stunning house in Armadale. 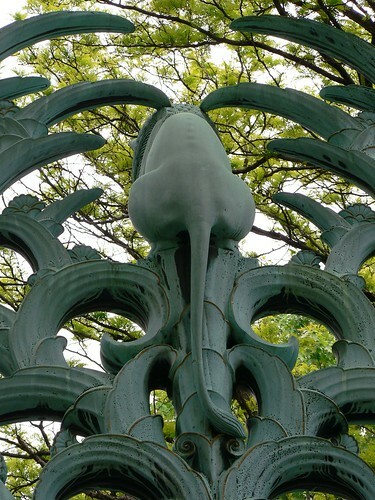 It is called Mon Reve and that name is inscribed on the amazing concrete gate posts with built-in lighting on top. 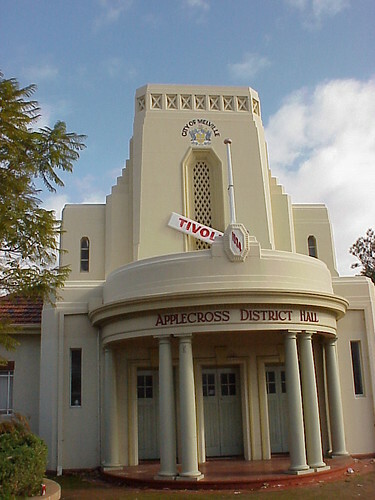 Applecross District Hall by architects Eales, Cohen and Bennett (1934) is a great little building and quite rightly was given an A+ rating in the City of Melville Municipal Heritage Inventory 2004. Great to see local government undertaking these these types of surveys to rate their local built environment with a view towards preservation. 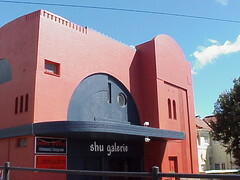 The Art Deco Architecture Cape Town Map produced by the Cape Art Deco Society includes this building in Wale Street. 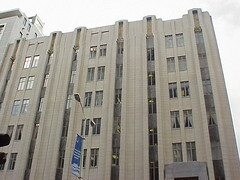 Now called Waalburg, it was originally the Sanlam and Sanlam insurance company and dates from 1932 by architects Louw and Louw. 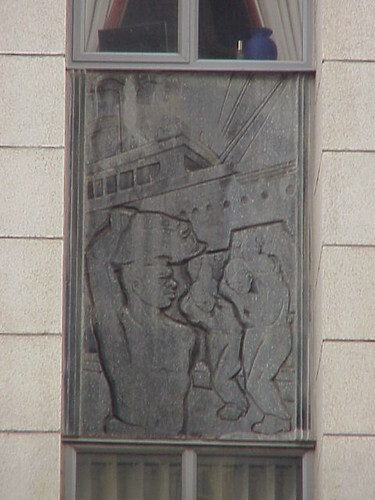 Relief panels in bronze and Table Mountain stone depict the themes of life in south Africa. 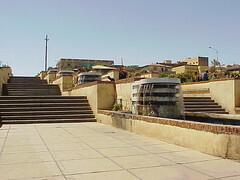 The Mai Jah Jah Fountain follows the steps down from the suburb of Gezzabanda towards the centre of Asmara. Contructed from a series of large rounded columns this fountain with the surrounding flowerbeds certainly makes a statement. From what I hear, I was lucky to see it with the water running because I know other people who have been to the fountain several times and never got to see it running. 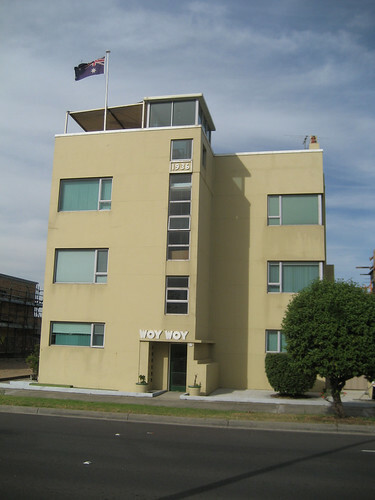 Woy Woy is one of my favourite Melbourne buildings. 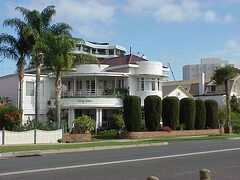 Designed by Geoffrey Mewton and constructed in 1936 it is ideally sited on Marine Parade near Elwood Canal. It is a bit crowded in by it's neighbours now but for a short while there a couple of years ago there were vacant sites on either side and Woy Woy stood in beautiful isolation. 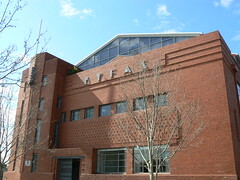 Robin Grow in Melbourne Art Deco features the BYFAS building in Abbotsford as a great example of re-use of an industrial building to meet 21st Century requirements. 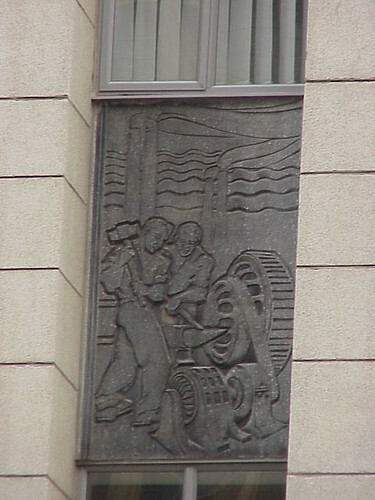 The 1937 building was designed by Joseph Plottel and was converted into apartments in 2002. 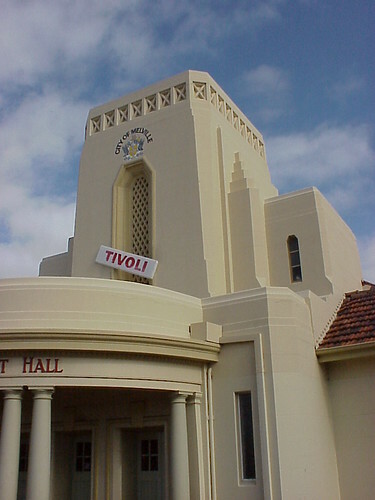 Going under various names incorporating the name Yarra Falls, from which the contraction BYFAS is derived, the building was originally part of a spinning mill and textile production complex. 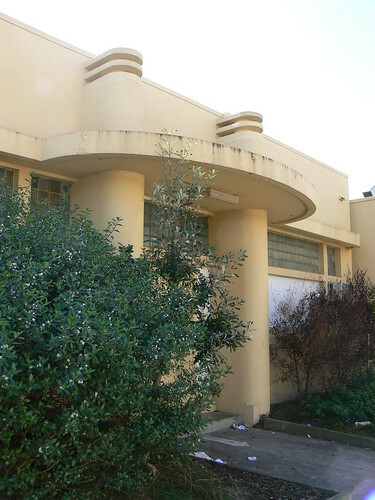 According to the City of Yarra website parachute silk was manufatured here during WWII. 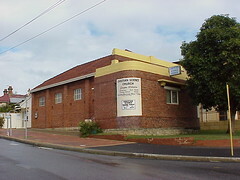 The Art Deco Architecture Cape Town Map produced by the Cape Art Deco Society includes the former synagogue in Vredehoek. 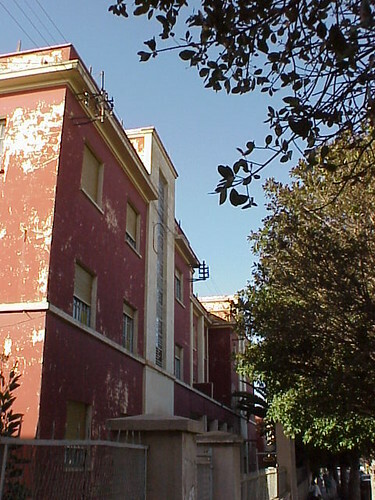 As you can see, the old synagogue has been deconsecreted, painted red and serves as premises for a variety of commercial ventures. 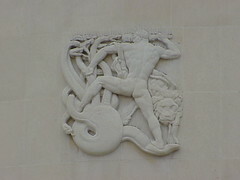 I wonder what the architect Dr J Ingber would think of his 1938 building with it's current colour scheme. Like Power Mobile, this is another strange little shop in St Vincent Street, Port Adelaide. 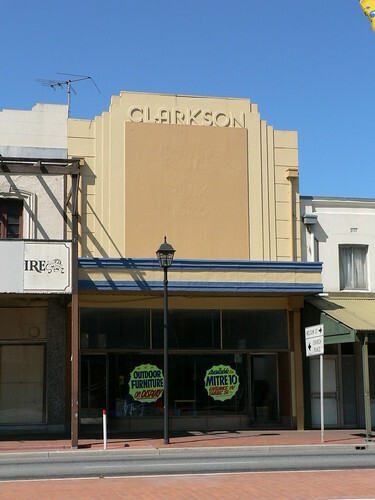 Obviously the whole top part of the shopfront has been boarded up, except for the Clarkson name, and it was a furniture shop a few years ago when I took this photo. I hope it is still there and I'd love to know what is under that boarding. 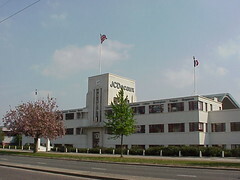 J C Decaux have chosen this wonderful Art Deco building on the Great West Road (A4) in Brentford as their UK Head Office. I know from a distance or a speeding car it doesn't look that special but stand in front of it and there is lots of nice features to take in. 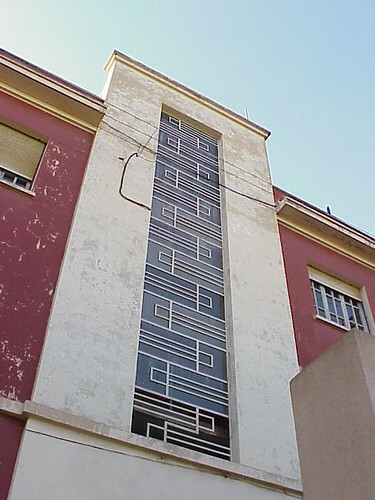 The rectangular wings featuring their red metal framed windows have rounded ends where they meet the central tower. 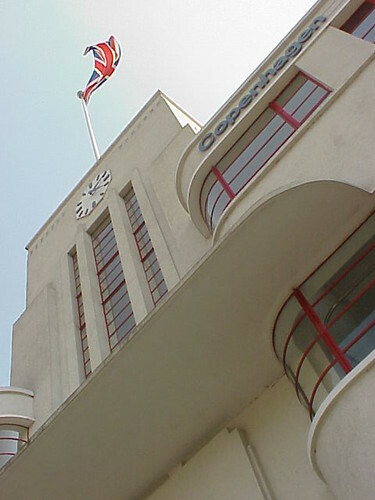 The tower itself has a clock and the ubiquitous flagpole. At the edge of the wings the windows cut through the corners creating a spacious feel to the building. 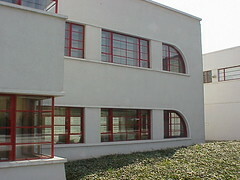 Then another section of the building is set back from the road with lovely rounded quadrant windows at the end of the two horizontal bands. And I make no apology for the inclusion of this arty photo, just because I like it a lot, especially the way I caught the Union Flag in mid-flutter. I feel very lucky today. Flew into New York on Saturday and found out part of the Guggenheim Museum's 50th anniversary they are staging a restrospective exhibition of Frank Lloyd Wright and it opened last Friday. So I joined the queue at 10am and spent almost 2 hours looking at the original plans of many of Wright's greatest projects, built, demolished and unbuilt. The plan for the Greater City of Baghdad was amazing, unrealised of course. It was great to see some of the buildings I have been lucky enough to visit such as Price Tower, Fallingwater and the Lloyd Jones house in Tulsa. The exhibition also had lots of slide shows of many of the buildings during construction. I highly recommend you visit the exhibition if you get the chance and it is perhaps all the more special that it is being staged in one of Frank Lloyd Wright's most recognisable buildings. 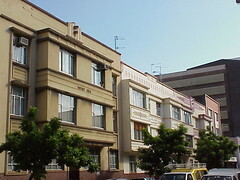 One of the many Art Deco apartment blocks in Asmara. My favourite part is the alternating metalwork on the window of the stairwell. 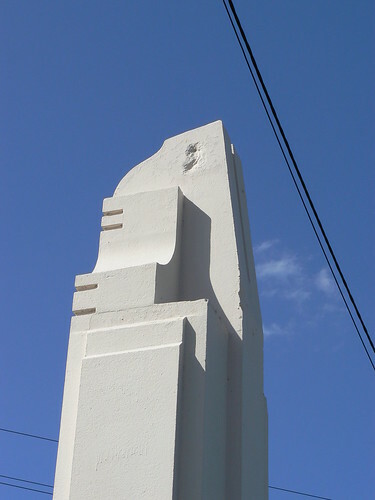 These columns are at the entrance to the former Taraxale Brewing Company in Brunswick. 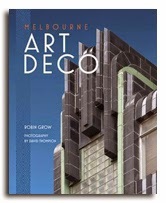 Taking some information form Melbourne Art Deco by Robin Grow the building dates from 1938 and was designed by Gawler and Drummond. Today it is at the side of a supermarket and needs a lot of loving. While the bushes in the photo below hide the mindless graffiti tags I couldn't hide the litter that has gathered in front of the doorway. Dynon Road leads from the western outskirts of the Melbourne city centre to Footscray crossing the Moonee Ponds Creek via this wonderful concrete Art Deco Bridge. 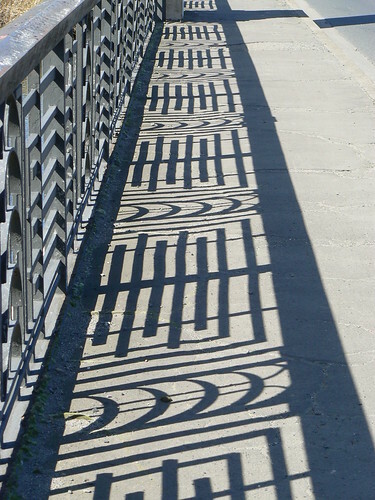 Decorative metal railings link the pylons completing the structure of the bridge. 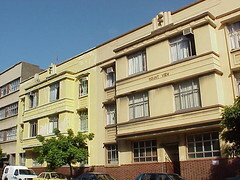 Mount View is another fabulous Art Deco apartment block in Carlisle Street, Durban. In this view you can see Mount View in the foreground and Berea View further back. They look identical to me except for the colouring. Their decoration is very simple. 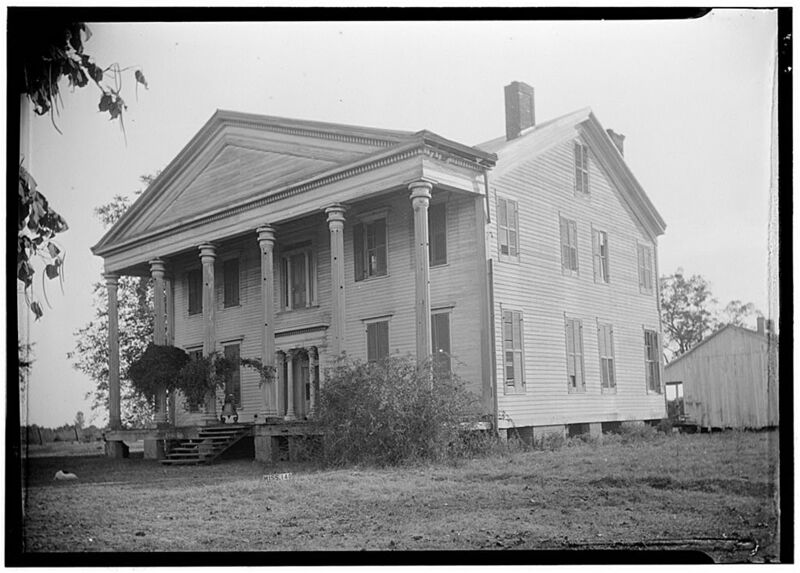 Horizontal lines below the second and third floor windows, a row of circles connected by a line above the top windows and a central flagpole support with more horizontal lines behind that. 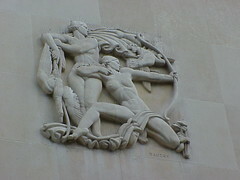 The view looking down Carlisle Street in the other direction highlights how good it is for Art Deco. Mount View is again in the foreground but this time we can see Vel-vet Mansions and Carlisle Castle each with different and more elaborate decoration. 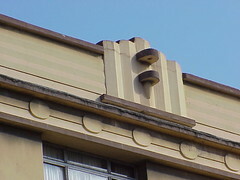 Three of the four deco building in this street used to have flagpoles. I can only imagine how good it would look if they were put back. 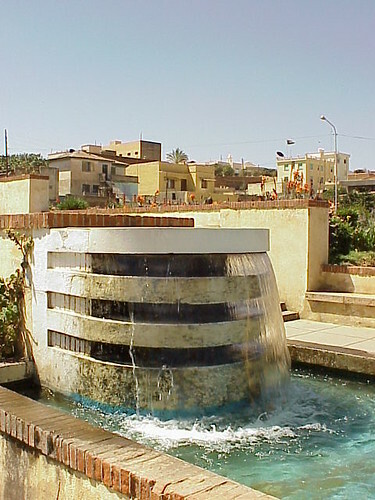 The Villa Quarter of Asmara is doted with fabulous residences dating from the Art Deco era. 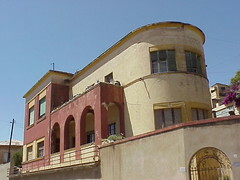 This is the Villa Grazia which is listed in Asmara, Africa's Secret Modernist City by Denison, Yu Ren and Gebremedhin as dating from 1942 by architect Antonio Vitaliti. Denison et al write that villas of this size were not built after the 1940s because many expats left during the federation with Ethiopia in 1952 and single storey dwellings were preferred. To me this is a classic building as a ship complete with a rounded bow and deck railing along the side. 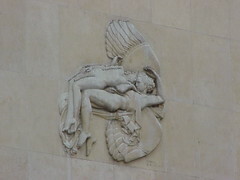 The Palais de Tokyo was designed by Dondel, Aubert, Viard and Dastugue for the 1937 Paris International Exhibition. 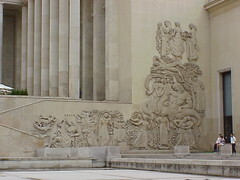 The buildings around the reflecting pool include an array of structural reliefs including the one above by Alfred Janniot and other smaller sculptures by such artists as Baudry and Marcel Gaumont. This may not be the most picturesque view of the Ranui Flats on Marine Parade in Napier but it does clearly show the driveway in the middle of the building leading through to the parking area behind. It reminds me of much earlier buildings which often had stables or a yard out the back and therefore required a large opening like this to allow horse-drawn carriages access. 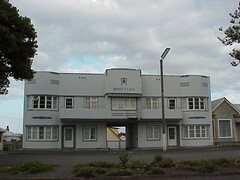 Ranui Flats date from 1938 so this is a nice throw-back from the Car Age. 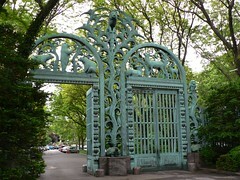 Paul Manship sculpted this wonderful array of animals on the Paul J Rainey Memorial Gateway at the Bronx Zoo in 1934. Bears, birds, antelopes, baboons and a lion, king of the jungle, sitting atop an amazing plant sculpture between the two gates. 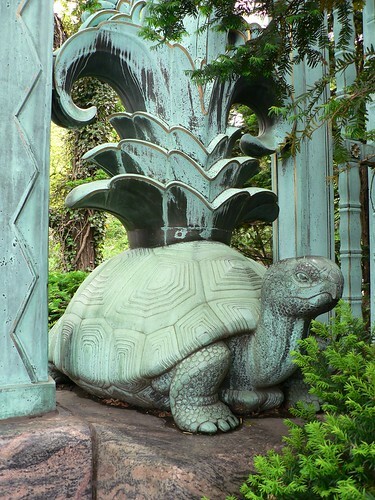 Three turtles site on plinths at ground level. 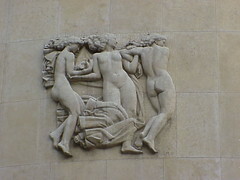 The middle one, a favourite with visitors, it's head rubbed smooth from the many hands seeking that touch of luck. It's two companions partially hidden in the foilage so not to attract as much attention. 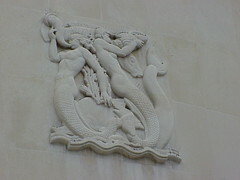 Manship's attention to detail can be seen on the backside of the gates. 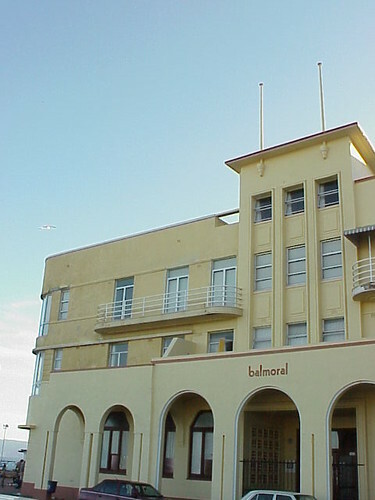 The seaside Cape Town suburb Muizenberg has under gone a renaissance in recent years but even six years ago the Balmoral Hotel looked pretty good. 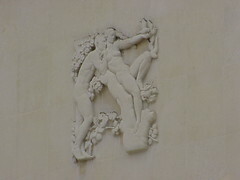 It's deco heritage is obvious. 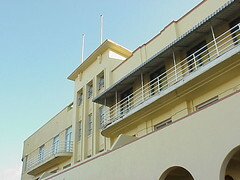 Twin flagpoles and metal-railed balconies with curved ends. 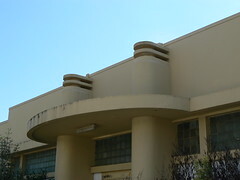 The building itself also has a curved end, probably a flat roof and a series of arches at ground level. 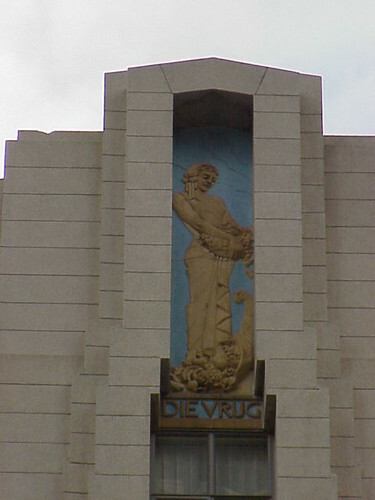 Another deco building occupied by a church. 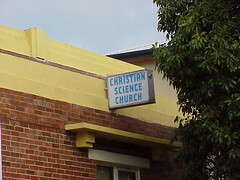 I don't know if the Christian Science Church in Fremantle have taken over this building or whether they built it and still live there. It is a shame that their bright white sign blocks most of the glass block window on the curved corner but I suppose even churches need to advertise and this is the view from a major highway. Pity they couldn't find a more sympathetic way to do it. 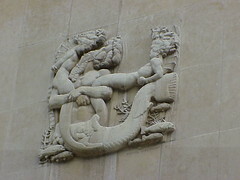 Their much more modest (in size) sign on the front of the building is much more in keeping with the overall style of the building. Perhaps this does point to the church being the original occupant. I do like the bookshelf providing shade above this small window. The stepped supports look chunky for the weight they need to bear but they have enough style to carry it off.